Jewishness, Jewish Power, detractors, history, Khmelnystky, Soros, Palestine and more..
Alimuddin Usmani: The French Israeli film maker Esti is making short movies in which she asks some famous Jews and non-Jews to answer her question in one minute : “C'est quoi être juif?” (What does it mean to be a Jew?) How would you answer this question? Alimuddin Usmani: The French essayist Alain Sorel has been virtually banned from the mainstream media since 2004, when he started to explain the Zionist control of over French media and politics. Are you encountering the same problem in the UK? 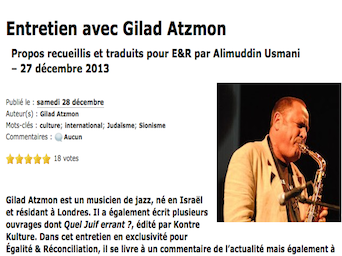 Gilad Atzmon: I am in a different situation than Sorel. I am primarily a musician. Though the attempts to ban me are intensive and relentless my career has been hardly affected by it. It would be correct to argue that I am not welcome within British Zionised media, however I never felt the urge to explore my voice through these channels. I contend that we do not need mainstream media anymore. The circulation of my writings is huge, I see my papers posted regularly on the biggest and most important dissident journals, my latest book was a best seller without any support from the mainstream media. Each of us can become a TV station. The only thing that matters is the quality of the content that we produce. I can see that many of Sorel's clips and writings are spreading virally on the net. This is the only thing that matters. How can we explain such a high level of tribalism in the French government? Gilad Atzmon: Do we have to explain it? As far as I am aware you just did. Jewish Identity Politics is a tribal operation. It is a dynamic form of identification that is fuelled by Pre –Traumatic-Stress and as I mentioned above it is also driven by negation (the capacity to evoke animosity in others). Once Jewish politics becomes a dominating factor, society would transformed into a fragmented structure shaped by a manifold of identity discourses. Rather than engaging in crucial priorities such as production, health or education, we would be concerned with marginal topic such as ‘gay marriage’, ‘anti Semitism’ etc. In short, the marginal becomes the centre. This is the reality of the tribal politics in which we live. The Left that was primarily concerned with Working Class politics has been hijacked a while ago, it isn’t even fully familiar with the notion of labour anymore. Alimuddin Usmani: How do you explain that the release of your book ‘The Wandering Who?’ was condemned by so-called anti-zionist authors such as Richard Seymour and at the same time endorsed by so-called respectable figures like John Mearsheimer? Gilad Atzmon: Richard Seymour is not exactly an anti Zionist. I actually see him as an instrument of Jewish power. He’s been operating for many years as a Sabbath Goy within the British Radical Left. Recently we learned that Seymour was amongst the leading advocates of Western intervention in Syria, is this what we call an ‘anti Zionist’? in my book this is actually what contemporary Zionists are all about. I have never come across a single clever or scholarly argument by the man. Did you? He produces an archaic Marxist rant that has zero relevance and obviously attracts zero interest. When it comes to my book, Seymour didn’t produce an argument. He just insisted that Zero Books drops the title because it was ‘anti semitic’. Seymour was quick to learn that it was him who was actually left behind. The list of the people who endorsed my book is pretty impressive. Prof. John Mearsheimer, Prof. Richard Falk, Prof. Norton Mezvinsky and others were subject to a vile campaign due to their support of my work. We saw the notorious Alan Dershowitz performing one of his tantrums on FOX News, we read veteran Israeli concentration guard Jeffery Goldberg spitting blood and lying to his teeth over my book. In fact, I really didn’t expect any living being to stand such an attack. But they did, they stood up for scholarship and integrity they defied the criticism and defended their endorsement. In fact, not a single endorser of my book surrendered to intensive the Jewish pressure. I guess that this is another sign that the tide has changed. Alimuddin Usmani: Ukraine has been in the headlines for several weeks. One of it's historical figures, Bohdan Khmelnytsky is considered as a national hero and at the same time a negative figure by jewish historians who point that he had made the eradication of Jews from Ukraine one of his goals. What is your own assessment of Khmelnystky's legacy? Gilad Atzmon: When I was a young and naïve Israeli I regarded Khmelnystky as just another Hitler figure - an anti Semitic morbid merciless creature. But then the inevitable happened, I grew up. I started to realize that Jewish history is a misleading concept. It is a peculiar inconsistent narrative that starts at the point Jewish pain is detected while ignoring the events that led to such pain to occur. Once I read Israel Shahak's Jewish History, Jewish Religion: The Weight of Three Thousand Years, I grasped that Khmelntysky actually led a popular uprising against oppression and as it happens the Jews were perceived as a prime instrument of that oppression. I guess that the next question should be what is it in Jewish culture, education and spirit that made Jews into an instrument of mass oppression. Tragically enough, this is the exact question most Jews prefer to avoid. I may as well have to admit that looking in the mirror launched an awakening process that led me to disassociate myself from the chosen tribe, its politics and spirit. Alimuddin Usmani: About the Israeli-Palestinian conflict: explain to us why a one state solution would be better than a two state solution? Gilad Atzmon: To start with, this topic is not really my business, I am a philosopher, not a politician or an activist. My task is to refine and redefine the question rather than producing answers or solutions. On top of that, I do not live in the region and do not have any plans to settle there in the future. As much as I don’t expect Palestinians to tell Brits how to live in the UK, I won’t advise them how to live on their land. For many years I have supported the One State Solution because this solution addresses what I believed to be the heart of the cause i.e. The Palestinian Right of Return (ROR). However, 2 years ago I learned that the BDS in Ramallah compromised on 1948 and the ROR, the revelation about this radical change didn’t attract any noticeable reaction amongst Palestinians. I realized that Palestine solidarity has been transformed into an industry. I gathered that the Palestinian cause was reduced from a cause into a symptom of Jewish power. Alongside I learned that most Palestinian NGOs are funded by liberal Zionist George Soros’ Open Society Institute. I accept that Palestinians may have their own priorities and I better concentrate on what I am good at – decoding Jewish culture and deconstructing Jewish power. Accordingly, I try to grasp what is it that preventing Israeli Jews from even considering the possibility of their state becoming a State of its citizens. I want to understand, for instance, how is it that Western Jews are amongst the leading advocates of pro immigration policy, yet, their Jewish State is the wildest anti Immigration apparatus around. These questions are obviously crucial. Unlike Palestinian blogger Ali Abunimah who believes that understanding culture is irrelevant for the political realization or process, I actually contend that grasping culture is the elementary key to any possible understanding of coexistence in the region.